CNN REPORTER AMBUSHES BLACK TRUMP SUPPORTER— GETS SCHOOLED! 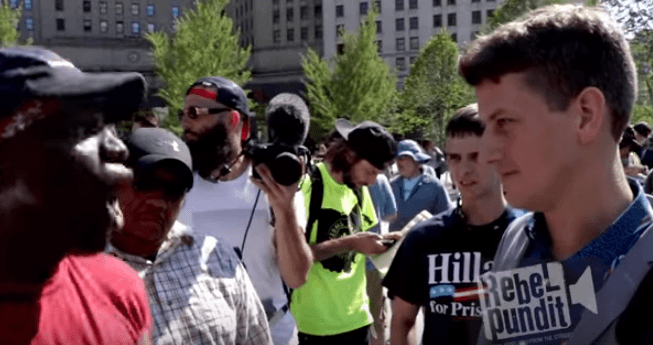 A CNN reporter ambushed black Trump supporter “Kenneth” outside the RNC in Cleveland. The CNN crank accused Trump of racism because some white supremacists who he disavowed support him. Kenneth let him have it! Kenneth the Trump supporter: I’m out here making sure I express my support for Mr. Donald J. Trump. And I’m fighting back against people like Black Lives Matter which CNN supports along with the Hillary Clinton foundation and Bill Clinton foundation, the traitors to this country. CNN reporter: What do you think of the fact that the white supremacists support Trump? Kenneth the Trump supporter: It doesn’t matter. That’s the right of free speech. I’m sick of this race and divide. And CNN is perfect at doing that. It’s always divide and conquer. People have the right to choose who they want. What the hell does that have to do with Donald Trump? He’s not a racist! I’m sick of that! It’s a scam and I know it’s not going to get on CNN. We’re sick of you media! Reporter Andrew Marcus to CNN: Are you saying Trump is racist because some racist guy supports him? Crowd: Yeah. Answer the man. That’s a good question. CNN reporter: I’m just here doing my job. Black Trump supporter: Trump is not a racist and it’s the media who gives us that perception… The hell with globalism! Because globalism takes America’s wealth. Reporter Andrew Marcus to CNN: Do Black Panthers support Obama, sir? CNN? Do Black Panthers support Obama?